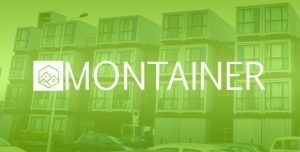 Montainer was founded by engineer Daniel in 2001. His team consists of architects, designers, engineers, and builders. They have come together to make buying high-quality, durable, unique and fully approved container homes a simple, easy and unique experience. Designing unique and simple solutions to any complicated problems has always been one of Daniel’s strongest traits. Like other engineers, the founder of Montainer has always enjoyed taking things apart and putting them back together. While Daniel was working as a structural engineer, he became eager to know and understand the concept of living in a tiny house. He knew with his capability and skills he could make a unique, functional and structurally sound dwelling space. With the support of his wife Marie, he promptly quit his job and built the first Montainer Home for his wife. Marie has always been a talented designer and was able to balance out Daniel’s practical, modern design with stylish decor and rustic design finishes. The first black container home was a huge hit and laid the foundation for what was about to become a successful business. As time passed, the business gained attention. The functional and aesthetic spaces quickly grew in demand. Customers also desires having container homes when they first saw the modern container home created by Daniel. But, some people were more interested in larger homes as compared to the tiny ones. The basic model of the container home became a launch pad and served many different uses for the homes — from garden homes, to vacation homes, to guesthouses. Daniel and his team began to create and build true custom homes with different multi-container configurations. The homes they offer to the customers is a cost-effective custom home that surely meets the customer needs in a beautiful and unique way. Wherever you want it to place it — may it be a mountainside or in the middle of hundreds of acres, Montaner brings visionary homes to life.